Disinfection | DynaJets | Dynaflow, Inc.
DynaJets® hydrodynamic cavitation is a powerful and useful mechanism when applied to the remediation and reuse of water. The chemical and physical phenomena produced during cavitation bubbles expansion and collapse can be used for controlled oxidation of organic compounds in water such as pesticides, dyes, solvents, pharmaceuticals, personal-care-products, and the killing of bacteria, algae, and zooplankton. A number of mechanisms contribute to the removal of microorganisms by the DynaJets® technology including the generation through bubble dynamics of local shock waves, shear, high temperatures and pressures, as well as production of free radicals that result in oxidation. The DynaJets® have been shown to effectively disinfect Escheria coli, Klebsiella, Pseudomonas, Bacillus subtilis, Total Coliforms, and heterotrophic bacteria. In laboratory experiments, the DynaJets® have achieved a six (6) orders of magnitude reduction in viable cell counts of E. coli (initial concentration 1 x 107 colony forming units/ml) while operating at modest pressures (tens of psi). Inactivation of B. subtilis spores and efficient disinfection of bacteria in municipal wastewater and aquaculture wastewater have been demonstrated. Reduction of E. coli and B. subtilis colony forming unit vs. time when the contaminated water is treated using the DynaJets® nozzles at 40 psi. The DynaJets® are also effective in treating higher organisms such as algae, zooplankton and zebra mussel larvae. The DynaJets® have been used to rupture the cell walls of microalgae and to recover the triglycerides from the algae. 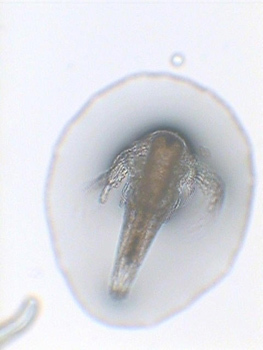 A single pass through a DynaJets® nozzle was sufficient to kill 99% of Zebra mussel larvae and 96% of brine shrimp (Artemia franciscana) nauplii. 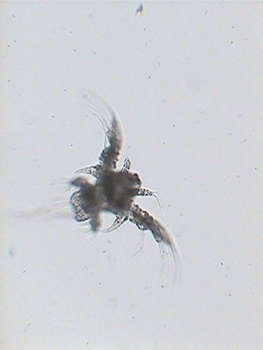 The photo on the left is a live Brine Shrimp larva prior to cavitation. The photo on the right is a dead larva after a single cycle through a DynaJets® nozzle at 60 psi, 96% of the larva were killed in a single pass.